The process of upgrading disposable hand towels is not complete until facility managers decide how to dispense the towels. This is a critical component of the decision-making process for facility executives who want to combat against cross-contamination and overuse and do not want their investment to end up down the drain. One of the solutions to combat against spreading infections and over-usage are small towel dispensers that sit next to the sink. Instead of industrial-looking dispensers that hang from the wall, these dispensers blend into the restroom décor, as manufacturers offer many colors and finishes, including stainless steel, which is typically considered upscale. “It (should) have that nice feel of using a luxurious embossed towel, but then the towels are protected in an attractive dispenser right on the countertop for the patron,” says Craven. In addition to making sure that dispensers match the restroom’s finishes, decision makers should choose counter dispensers that dispense towels correctly and one at a time. Users tend to take fewer towels if they are in dispensers rather than having high-end towels in an open basket from which users can grab an unlimited amount, says Leonard. One manufacturer says dispensers can reduce usage by 25 percent over baskets. High-quality towels that are housed in the correct dispensers also add to the perception of cleanliness of the restroom. 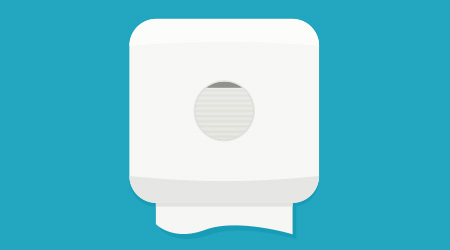 Having the end of a roll of paper towels hanging down from a wall dispenser, a pile of wet towels on the sink, or trash cans full of over-used towels all create a sense of untidiness and dirtiness in restrooms, says Neff.